"My college teachers have been so supportive – not just about my coursework but personally too. Their teaching style is informal – but in a good way." Wildlife enthusiast Leo Kokoszko loves his job working with seals and promoting marine conservation to visitors at Sea Life in Scarborough. But Leo, who has autism, doubts he would have been able to pursue his dream career without the help and support of staff at Derby College. Leo, who is 20 and from Heanor, first arrived at Derby College to study Animal Care as at that time in his life he wanted to be a police dog handler. After achieving levels 1 and 2, he enrolled on the college’s Public Services course but didn’t enjoy it. So Leo revised his plans and switched to the diploma in Countryside Management and Conservation course, which he loved. Leo, who is passionate about nature and wildlife, is also a keen birdwatcher. 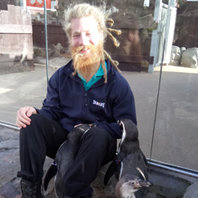 When he is not working at Sea Life, Leo also enjoys volunteering at RSPB Bempton Cliffs near Bridlington.